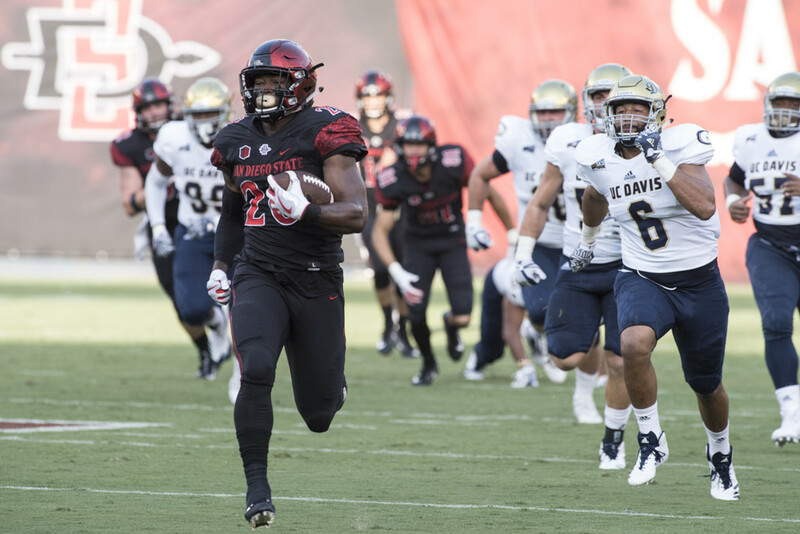 After his impressive performance Saturday, San Diego State senior running back Rashaad Penny was named the Mountain West Offensive Player of the Week, the league announced Monday. This is the eighth time Penny was honored with a player of week accolade. Penny rushed for 234 yards on 20 carries, averaging 11.7 yards, and three touchdowns in the win over San Jose State on Saturday. That was the second most rushing yard in his career and the 21st most in SDSU’s history for a single game. Penny also broke 100 yards for the eighth time this year and 13th time in his career and eclipsed 200 yards for the third time this season and fourth time in his career. Earlier this season, Penny became the first player in the conference’s history to be named a player of the week for four consecutive weeks. He’s won six player-of-the-week awards so far this season and eight for his career — the most in Aztec history. Last week, Penny was named a Maxwell Award semifinalist and has been named a second-team All-America selection by both Associated Press and Sports Illustrated. The Aztecs have a bye this week and will return for their final two games of the season at SDCCU Stadium starting next week against Nevada and New Mexico on Nov. 24. SDSU still has an outside chance to win the West Division if it wins the two remain games and Fresno State loses two of its three remaining conference games.